Brazilian Marines with the UN Stabilization Mission in Haiti (MINUSTAH) clearing the road to les Cayes, Haiti, after the passage of Hurricane Matthew. 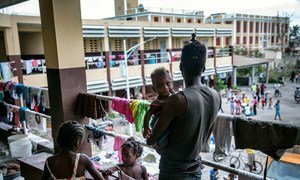 With Haiti facing the dual challenges of addressing the impact of Hurricane Matthew and restarting preparations for the holding of the much-anticipated elections, the United Nations envoy for the Caribbean country today expressed support for the recommended extension of the UN mission there by six months until mid-April 2017. “I call on all of Haiti's international partners to continue to lend your support to the country to rapidly overcome the new challenges occasioned by the hurricane so that focus of all can be returned to strengthening the country's economic, physical and institutional infrastructure,” said Sandra Honoré, the Secretary-General's Special Representative for Haiti, during a Security Council debate on the UN's mandate in the country. “This will allow MINUSTAH to support the Haitian authorities in their efforts to return to full constitutional order amidst the humanitarian crisis created by Hurricane Matthew,” said Ms. Honoré, who is also the head of MINUSTAH. She noted that MINUSTAH's civilian and uniformed personnel and capacities are being put to full use in support of the humanitarian efforts, by opening up access to roads, providing airlift and supporting the Haitian National Police in securing humanitarian workers and stocks, among other tasks. She went on to highlight that not only did Hurricane Matthew bring destruction to Haiti, it has also affected the country's political outlook, rendering impossible the holding on 9 October of the presidential elections repeated from last year, as well as the partial senatorial elections and legislative reruns. The Provisional Electoral Council has postponed the elections, pending completion of an assessment of the hurricane's impact on the electoral process, she said. Preliminary reports indicate that at least 70 per cent of voting centres may have been affected in the South department, and even more in Grand'Anse, where many areas are still inaccessible, she added. Prior to the disruption caused by the hurricane, which made landfall on 4 October, technical preparations had largely been on track for the holding of the elections, she said, noting that most political actors were committed to renewing the country's key democratic institutions through elections as a crucial first step toward Haiti's return to constitutional order, following the extended period of transitional governance. The commitment shown by the Haitian authorities to own the electoral process, including financial and operational aspects, is a promising sign for the country's future, especially given the eventual drawdown of MINUSTAH, the Special Representative said. One week after Hurricane Matthew slammed into Haiti, United Nations agencies are continuing the massive relief effort under way on the ground, scrambling to fend off the threat of cholera, delivering life-saving supplies and rehabilitating damaged infrastructure, such as schools.